Three-year-old Sofia Walker refused to back down when a lion viciously lashed out at her at Wellington Zoo in New Zealand last week. 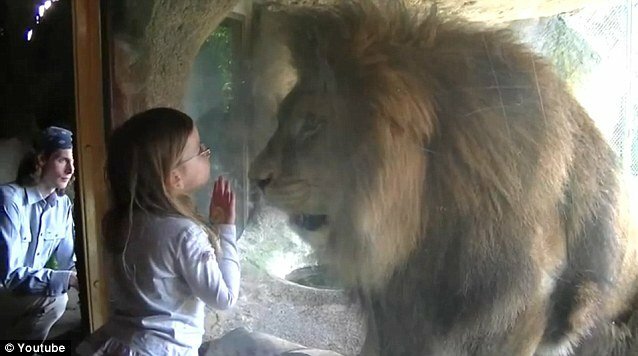 Fortunately for little girl, a thick pane of safety glass stood between her and Malik, the 7-year-old lion so incensed by her gall. The incredible moment was captured on camera by Sofia Walker’s father Julian. But Sofia Walker remained as transfixed with the animal as he was with her and the battle of wills continued. Then, once more unable to hold in his frustration, Malik pounced for a second time, wildly swiping his front paws against the glass as he stood on his hind legs. Paul Hatton, the zoo’s team leader of carnivores and primates, told the New Zealand Herald: “There were a couple of moments where she was a little bit surprised, which is fair enough completely, but she didn’t seem too bothered. Malik, who had been just given his breakfast, is an easily grumpy and defensive lion, Paul Hatton said. Malik has plenty of room in his enclosure, but on this occasion refused to move out of sight from visitors. The glass separating man from beast is 33mm thick and is constructed of three separate layers that are bonded together. Not even a sledgehammer could break it, Paul Hatton said. Pope Benedict XVI: "Gay marriage is a threat to the future of humanity itself"